THE sounds were coming from the basement: a rapid, staccato clicking of plastic against plastic, hundreds of times a minute, too quick and orderly to be described as a rattle and too rhythmic to be considered noise. In the downstairs den of his family’s home, Chris Chike was sitting in an easy chair with a toy guitar across his lap. While his eyes were trained on a big-screen television inches away, his hands were frantically working the bruised plastic instrument held together with masking tape. His left hand was tapping manically at five colored buttons on the guitar’s neck, while his right hand made graceful leaps between the neck and a large black button on the guitar’s body, where a real musician would be strumming at strings. His movements were precisely choreographed to the action on his television set, where color-coded musical notes stampeded down the neck of a simulated guitar in time to a relentlessly bombastic heavy-metal ballad called “Through the Fire and Flames.” Some 1,191 notes would whiz by before Chris missed a single one. This is the now-familiar ritual of Guitar Hero, the video game series that lets players (and spectators) replicate the adrenaline rush of a rock-music concert as rec-room Eric Claptons and Pete Townshends press buttons in time to popular songs, scoring points as they show off their hand-and-eye coordination if not actual musicianship. Despite his preternatural dexterity, Chris, would seem to be just one more avid gamer who has helped make the Guitar Hero franchise a towering success. It has sold more than 20.7 million copies worldwide since its debut just three years ago. Yet to the video game business Chris represents just the kind of player — the freakishly talented one-man spectacle — who could bring more revenue and legitimacy to the industry, and prove once and for all that video gaming is as much a mainstream American pastime as going to the movies or watching television. 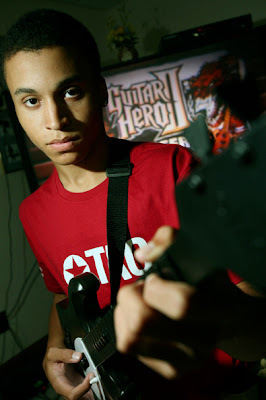 “A lot of people still have this perception of gamers being spotty 13-year-olds stuck in their bedrooms,” said Keith Pullin, the editor of the gamers’ edition of the Guinness World Records book, which recently declared Chris the best Guitar Hero player on the planet. “But Chris is a great example of how you can be a wholesome person and still be good at games at the same time.” All of which can be a little overwhelming to a soft-spoken young man who’s still not sure how he wants to define himself. The youngest of four siblings, Chris has owned almost every home video game console since the 1990s-era Super Nintendo (all bestowed on him by his father, Anthony, 52, who runs a computer business, and his mother, Claudia Knowlton-Chike, 50, a general manager for GE Healthcare). He also breezed through the hardest levels of the original Guitar Hero, released in 2005 for PlayStation 2, and its 2006 sequel, Guitar Hero II. When he posted screen shots of his accomplishments at Web sites like scorehero.com, he noticed his scores were significantly higher than his closest competitors. His unusual ascent was occurring at a time when the video game industry was discovering the potential of social games — which like Guitar Hero are meant to be played in groups and can be as much fun to watch as to participate in — to reach a previously untapped audience. Every Guitar Hero needs a nemesis, and Chris found his in a song called “Through the Fire and Flames,” a track that appears in the game Guitar Hero III: Legends of Rock. Performed by the British power-metal band Dragonforce, “Through the Fire and Flames” (or simply “TTFaF” to die-hard gamers) is a brutal tour de force of finger-tapping, consisting of 3,722 notes over seven and a half minutes. The song is available only to players who have completed all the other tracks in the game, and they are not expected to master it so much as simply to survive it. Over a period of weeks and months Chris practiced the song in the family den, surrounded by walls decorated with his mother’s homemade Western shirts, family photographs and a picture of his maternal grandparents with President Bush. He completed the song to 96 percent accuracy, then 98 percent, but kept falling just short of perfection. Then, late on the night of June 3, with his $80 video camera recording him for posterity, Chris played the song flawlessly. His hands still trembling, he shouted a few expletives and raced to upload his footage on YouTube, where the online world had already been tipped off to his accomplishment when his astonishing score was automatically uploaded to an Xbox Live leader board. Within a few hours, Chris estimates, the video of his perfect “TTFaF” performance had been viewed more than 10,000 times; it has since been watched more than 2.1 million times — a particularly astounding tally for what is essentially a video of someone pressing buttons. This event, in turn, caught the attention of the Ant Commandos, makers of video game hardware in Ontario, Calif., which struck an agreement (negotiated by Ms. Knowlton-Chike) for Chris to be its public face. He now lends his gaming expertise to design sessions for a forthcoming line of Guitar Hero controllers, and his café au lait looks — he is the son of a white mother and a black father — to advertisements and packaging for Ant Commandos products. “Internally we call him our Tiger Woods,” said Raymond Yow, the company’s chief operating officer. Another name frequently invoked in connection with Chris is Tony Hawk, the skateboarding pioneer who parlayed his abilities into a multimillion-dollar empire of endorsed products, performance tours and, yes, video games, bringing the once-unfamiliar category of action sports with him into the spotlight. The American video game scene sorely lags behind other nations’ in generating and appreciating personalities who would be the field’s equivalent of Mr. Hawk. In South Korea, for example, the top players of strategy games like StarCraft are regarded as rock stars, with entire television channels dedicated to covering their tournaments and competitions. But American gaming culture may be approaching its own turning point. “We need that lightning-in-a bottle moment,” said Michael Arzt, a former marketing executive for the Gravity Games, an action-sports event, who is now the general manager of International Cyber Marketing, which runs a worldwide video game competition called the World Cyber Games. Mr. Arzt said American gaming needed the equivalents of Mr. Hawk’s 900-degree skateboard spin at the 1999 Summer X Games, or Carey Hart’s motorcycle back flip at the 2000 Gravity Games, to break through as a truly mainstream sport. Chris would sooner die a thousand deaths than discuss, say, the many Advanced Placement courses he will be taking this fall, or his score on the ACT. But put a fake guitar in his hands, and he becomes a different, dynamic person. Watching his Guitar Hero sessions, on video or in person, you can easily be hypnotized by the synchronized movements of his fingers as they bounce upon the diminutive plastic fretboard. He is clearly not making music with the instrument, but his performance is a feat of coordination in its own right. For example, she said, Chris agreed to appear at a gaming event in October in Amsterdam only after finding out that it would not conflict with his school schedule. He is also sorely tempted to buy himself a full-size Dance Dance Revolution arcade machine, which would cost several thousand dollars. “We’re learning to pay for things when we have the money,” Ms. Knowlton-Chike said. Chris is hopeful that his endorsed line of Guitar Hero controllers (scheduled for release later this year) will sell well. But he is also concerned about balancing his senior-year schoolwork and the time he spends with his friends, who he said were perhaps not as scholastically motivated. Having demonstrated his prowess at Guitar Hero, Chris switched over to another music game called Rock Band, which lets gamers play drums in addition to guitar. He sat down behind a small plastic drum kit and proceeded to pound out an immaculate recreation of Keith Moon’s percussion from the Who’s “Won’t Get Fooled Again,” improvising a few embellishments to the solos.